Did you miss the lunar eclipse? No problem. The Coca-Cola Science Center recorded it for you. Click here to play the movie. MOTHER'S DAY AT THE EDGE OF SPACE: Mother's Day is right around the corner. Looking for a unique gift? How about an Edge of Space Mother's Day Card? This weekend, the students of Earth to Sky Calculus will launch a helium balloon to the stratosphere. For only $49.95, your Mother's Day, Father's Day, birthday or anniversary card could be on the payload. Profits from the flight are used to support the students' space weather balloon research program. Contact Dr. Tony Phillips for details. 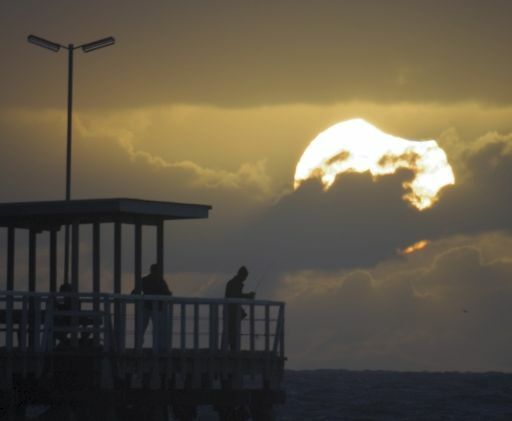 "Here the eclipse peaked at 51% and was still in progress as the sun was setting," says photographer Martin Lewicki. "We could see it clearly through the clouds." SOLAR SUPERSTORM NARROWLY MISSES EARTH: Two years ago, a Carrington-class solar storm narrowly missed Earth. If it had hit, researchers say, we could still be picking up the pieces. Get the full story from Science@NASA. "We aurora chasers, hunters and worshippers fight a battle against the magic midnight sun which cannot be won," says Kast. "Every night it gets brighter and the chances for auroras fade. As you can see from this photo - taken at 1.30am - the aurora is barely visible against the twilight. 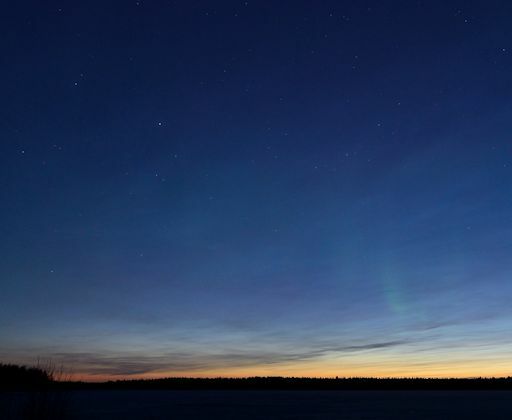 There are still a few nights with the sun more than 10 degrees below the horizon, but we will need a strong impact to see some nice auroras overhead." 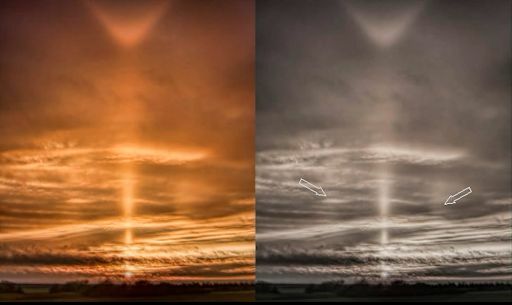 Atmospheric optics expert Les Cowley explains: "13 years ago in Finland, three halo experts saw peculiar 'echoes' straddling an otherwise ordinary sun pillar. They could not be explained and there the matter rested for want of confirmation by another observation. Then, last week, Jon Inghram sent me several sun pillar images. He too had noticed faint 'echoes' on each side of his pillar – the mysterious ice halo was at last confirmed!" "More details and pictures may be found in an article here. But we still cannot explain them. The Finland observers, Jon and I have each tried simulations using the flattened pyramid crystals invoked to account for elliptical halos. They do not work at all well. We need many more observations! Take plenty of pictures of each pillar. The echoes are easily overlooked or mistaken for cloud patches and have probably been seen many times. Observations under different conditions could help unravel their mystery." On Apr. 27, 2014, the network reported 7 fireballs. On April 29, 2014 there were potentially hazardous asteroids.